Turn the television off and get back to the basics was the message from a learning expert who spoke on campus Sept. 16. OCCC’s Child Development Center and Lab School recently hosted Susan Donchin, a 15-year veteran of the Ready to Learn program. Ready to Learn is a community outreach program partnered with Oklahoma Educational Television Authority, the Oklahoma Department of Libraries and Department of Human Services. She said recent studies show the best child development results from the interaction between a child and his or her parents or other adult caregivers. She cited Dr. Bruce Perry, Child Trauma Academy senior fellow and an adjunct professor of psychiatry and behavioral science, who said the most important thing for children’s brain development is to provide children with emotionally secure, safe and loving relationships. “Love can be seen in a brain scan,” Donchin said as she provided handouts of two children’s brain scans. The toddlers depicted were about 18 months old. The first brain, glowing brightly with activity, is that of a healthy child. The second brain was much darker and clearly not as developed as the first. It was that of a neglected child from an orphanage in Romania. “The only interaction that child received was to be picked up, fed, burped and placed back in its crib,” Donchin said. Remember learning about the five senses in grade school? Donchin explained that each of the five senses provides a caregiver with an arsenal of learning tools. “For a baby, touch is the most important of the five senses,” she said. She said just a simple tickle makes neurons connect in a baby’s brain through a synapse, and illustrated using two pieces of spaghetti to symbolize the neurons and a piece of elbow macaroni to symbolize the synapse. “It’s a natural instinct,” she said. Babies’ brains develop more with the sweetness of baby talk and various ranges in the voice as opposed to a normal adult speaking voice which Donchin correlates to the nagging monotone teacher voice from Charlie Brown videos. She said another key element to a child’s brain development is reading. The personal time spent reading with children provides a strong emotional bond, Donchin said. It also helps to enhance a child’s imagination, as well as stimulate vocabulary. Recent studies show the more words children hear each day the better capacity they have to excel in school. So the next time you hear a child ask “What’s that?” instead of just telling the little one it’s an orange, describe the orange, tell where it came from or what it tastes like. Let the child feel and smell the orange. Interact with children verbally in more detail, Donchin advised. 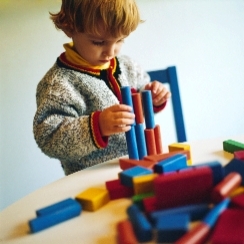 Other influences on children include their home environment. A calm and positive environment produces a more emotionally-enriched child, Donchin said. Children learn from their caregivers and are watching their actions all the time. It is similar to being on camera all the time. If hostility or anger are displayed in front of children or directed at them, the same children can become angry themselves and learn to condemn others, which also can lead to behavioral issues. Donchin said the best way to avoid an unhappy home is to ensure parents take time for themselves as well as their children. If parents are not taking care of themselves, they cannot expect to be effective in taking care of others. Donchin said parents can become run down and stressed. Taking just a few minutes a day for a personal moment makes a big difference, Donchin said. Enjoy an activity such as exercise, reading, listening to music, relaxing, or swimming to name a few. “If your schedule is too busy to take that much time away, at least take two minutes in a room alone and try some deep breathing,” Donchin said. She said any time parents can get to themselves to relax is better than nothing at all. OCCC’s Child Development Center and Lab School will be sponsoring several additional parenting workshops over the next several weeks. They are free and open to the public. For more information about times and locations, please contact the center at 405-682-7561 or visit www.occc.edu/ChildDev.